Here Be Dragons is a place of wonderment and enchantment on the banks of the Sangker river. Whether you’re excited about exploring Battambang's art scene and countryside, or you just need to relax after the bright lights of Siem Reap or Bangkok, step off the map and lose yourself in the world of the dragons. The beds were layed out nicely, making it more communal than most hostels which have bunks in a line. Each night there was an event on (pub quiz, yoga ect.) which was fun to join in with. The hostel was really helpful in finding tours/activities for you to do, and also booking transport for you to get to other cities. There were lots of social areas which were really nice and spacious. I can’t fault this hostel. Really nice place, would recommend getting an ac room over Fan as it got quite hot in the night. Garden with hammocks and comfy seats to relax in. This is a lovely clean hostel with a very pleasant communal area with a shadow and plenty of places to sit (and seven cute cats!). They could do with bigger lockers in the dorms, but the beds were comfy and private. Great value for money, slightly away from the town but the walk is lovely! Private room was very basic with a weak shower but was very clean, only complaint was it was very hot even with fans on (hotter than outside?) great common area and lovely staff, great atmosphere on the open mic night! Very nice food and reasonably priced drinks. Tuk Tuks outside if you need one. Rooftop yoga session was fun!! 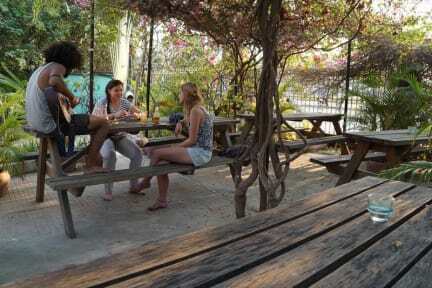 Good hostel to choose if you like a chilled but fun vibe. Nice and relaxing place to stay. Bathrooms were little weird, clean but very old. Strange atmosphere, it seemed there were not that many guests but more people/expats who hung around there during the day who all knew each other already. Made it difficult to meet people. I cannot fault the owners (the cambodian people who worked there during the day), they were so lovely and friendly. I asked lots of questions about our buses etc. and they were happy to help. Food was great and well priced. Atmosphere downstairs in a bar was amazing, cool place to spend an evening around with old rock music playing in back round. Location and food were excellent. The major failure was that the room we stayed in had NO A/C unit in it, just two fans that did nothing to relieve the relentless heat. Please invest in air con to all your rooms, not only dorms as the price is still low so I'm sure you'll get plenty of customers even for higher price. 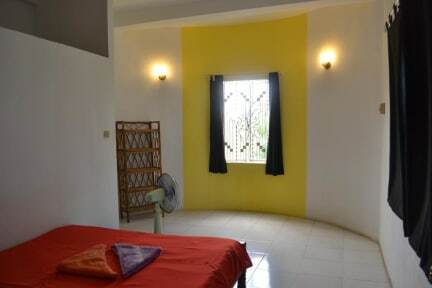 Me and my friend shared a private room in the hostel and found the bed very comfortable, however there was no AC in the room at all which made it stiflingly hot all day every day. The hostel itself was nothing to write home about, however the staff were very pleasant.